The top of the line option for full-colour lanyards, myZone Canada’s custom printed lanyards are ideal for those looking for a highly personalized lanyard option. Custom printed lanyards boast a satiny-smooth finish and a printed image that is mirrored on both the front and back sides of the lanyards for a seamless appearance. 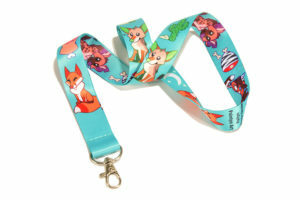 Our custom lanyards are printed using sublimation processing. With shipping available to anywhere in Canada, these lanyards are incredibly comfortable, water-resistant, stretch resistant and come with the option for add-ons like buckles, clips and badge holders! When you buy custom printed lanyards it gives you the opportunity to personalize your bands with your own logos, designs, or slogans – allowing you to market your brand like never before! Printed Lanyards are shipped within 8-14 business days from the time the design proofs are approved. If you’re short on time, please contact us to see if a rush production is possible. The team will do their best to meet your deadline!